Is Trump already escalating war in Yemen? The US ground operation in Yemen last weekend, and President Trump’s decision to continue Obama’s drone strikes might outrage people as hypocrisy, says politics author and journalist David Swanson. One US commando was killed and three others wounded during an operation in Yemen, the first American military casualties of Donald Trump's presidency. A statement from US Central Command said the soldier died in a raid against Al-Qaeda on Sunday morning. 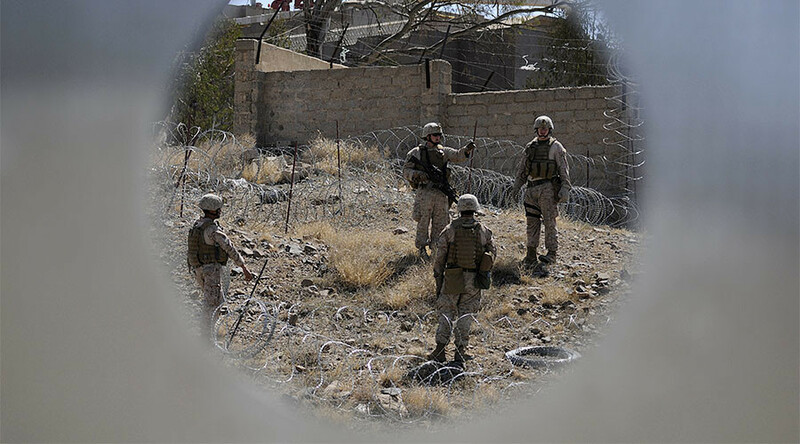 It is the first formal acknowledgment that the US has forces on the ground in Yemen. RT:The US has been conducting drone strikes in Yemen for years, but this ground operation, approved personally by Trump, marks a dramatic escalation. What impact could it have on the situation in the country? David Swanson: I don’t know whether it marks an escalation, but it marks a new or at least an unusual rare form of US involvement risking US lives, which is what the US public gets informed about and has been trained to care about. But the drone strikes also have continued since Donald Trump became president, whether or not with his individual involvement because President Obama gave various subordinates the right to pick people out and murder them with missiles from drones. That too may get anger from the US public, because this is a different person doing it. It would be a sort of hypocrisy and a sort of partisan blindness. But I certainly hope so. At this point - the US having sat through years of drone murders by President Obama - if people get outraged about it now under President Trump, that would be a good thing. RT:Trump has been highly critical of past military interventions, but just a week into his presidency, he's already escalating the US role in Yemen. Where could this be heading? Are we likely to see a more aggressive US military role? DS: I am certain this was a proposal that went to him from the military. He didn’t dream this particular little action up – he gave his approval, and he campaigned on the uselessness of NATO. “We might need to get rid of NATO.” And the minute he got the slightest pushback from the US military. He said: “Oh, I didn’t mean that. We’ve got to make NATO even better, just want people to pay their fair share." He campaigned against the F-35, an expensive military airplane; got a meeting with the military and the manufacturer Lockheed Martin... So this is someone who shows every indication of going along with the military establishment in Washington DC, which he wants to increase funding for and enlarge. He went on day one to the CIA and said: “We have a chance to steal Iraq’s oil,” whatever he meant by that. And we might get another chance.” Yes, he said: “Let’s not intervene; let’s not overthrow governments,” but I don’t see a real principal stand there. We will have to try to hold him to that. Tighe Barry, anti-war activist from the Code Pink group said the US has been supporting “the Saudi invasion, incursion, and massacre of Yemeni people for 22 months now”. Even though Washington has claimed that it has been giving “only logistics and support by refueling and things like that” it is also known that the US sold arms worth billions of dollars to Saudi Arabia, the activist told RT. “They never mention the fact that they had troops on the ground. The new president wasted no time in starting drone strikes. Now that we’ve found out that there are troops there, I do believe that we should get into this story more and find out how long have the troops spent there. Then the fact that some American soldier has died in Yemen, we have not created a state of war with Yemen. We’ve been attacking them with drone strikes claiming that they are going to someday affect the US. This is the poorest country on the Arabian Peninsula being attacked by the richest country on the Arabian Peninsula…and by the richest country in the world and the largest military might in the entire world. This is appalling,” Barry added. Meanwhile, two peace activists were detained Sunday in the UK for trying to disarm warplanes that would allegedly be used to bomb Yemen. The two men are Sam Walton, a Quaker activist, and Dan Woodhouse, who is a Methodist vicar. 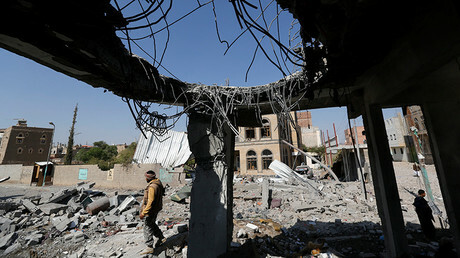 They broke into an aircraft hangar, owned by the arms company BAE Systems, which has made warplanes used in Saudi Arabia's ongoing bombing of Yemen. These two men are being investigated for criminal damage. “Yemen is an extremely poor country. The IMF has cut off its all possibility of purchase of wheat from Yemen by moving the Central Bank of Yemen to Aden, which is under the control of the foreign military occupation of Saudi Arabia with the help of the US. There have been numerous war crimes in Yemen,” he said. “We’ve got to stop these arms sales to the largest human rights violating country of Saudi Arabia,” the activist added.